Dare to wear your Formal Shows outside of the office. Gone are the days when a pair of formal shoes only looked right in the workplace. Not so long ago, the very idea of wearing a pair of brogues or loafers with anything but a suit would have been an instant fashion faux par. The secret is all in what you wear them with and ensuring your colours and textiles work together. If, for example, you’re wearing a pair of blue jeans then you want to be looking at soft textures such as a calf suede in tan colour. Other trousers work better with an intentional colour clash; Try wearing a pair of mustard chinos with an African Violet or Brilliant green in Ostritch skin. 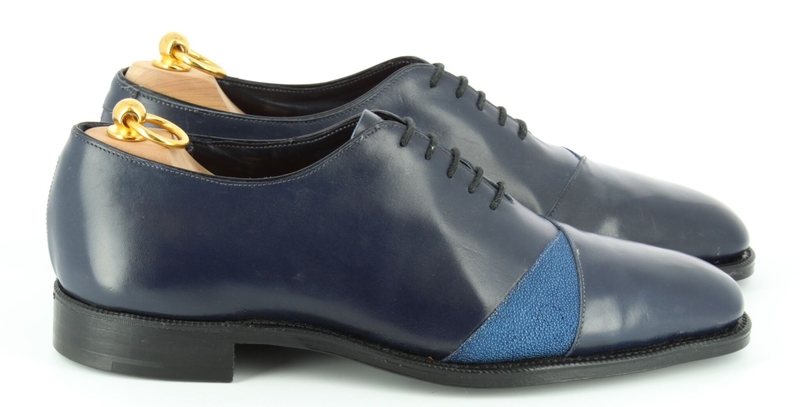 These Navy Blue Welted Oxford's would also work well. Loafers can be even more versatile, working well with classic shorts or a pair of black jeans. Don’t be afraid to mix and match colours and styles – an intentional clash can really look the business. Check out our full range of styles, colours and materials in the Customise Your Shoes section of our website. It’s completely free and simple to use our instant design software.